“The preparations of the heart in man, and the answer of the tongue, is from the LORD” (Prov.16:1). Pastor Arnold Wayne Weckeman, a native New Yorker grew up in Staten Island, N.Y. In 1969, after serving 3 years in the United States Army he returned home and worked for Consolidated Edison and then on to a 20-year career as a New York City Firefighter. At age 38 he trusted Jesus Christ as his personal Saviour. Shortly after being saved he met Pastor Mel Sabaka and began attending services at Bible Baptist Church. While under the preaching and teaching ministry of Pastor Mel and many other godly men (Pastors, Joe Silvestri, Pat Dean, and Mike Veach) Wayne felt God’s call to the ministry. During those formative years, he and Sandy were discipled and learned to minister both to the saved and the lost. Wayne served as a deacon and then head deacon overseeing the Church’s discipleship ministry. In May of 2000 after attending Bible Institute, he was ordained. In June of 2000, pastor Wayne began holding Bible studies and Sunday services in Pike County PA. As the Lord blessed and the ministry grew the decision was made to establish First Bible Church in Lord’s Valley. After 7 years of pastoring First Bible Church his wife’s chronic illness (fibromyalgia) had progressed to the point that a relocation to a warm, dry climate became unavoidable. After much prayer and godly counsel, a move to the southwest was decided. During that difficult time, the Lord graciously raised up a dear brother in Christ, Pastor Dan Ralston, to take over the work in Lord’s Valley. 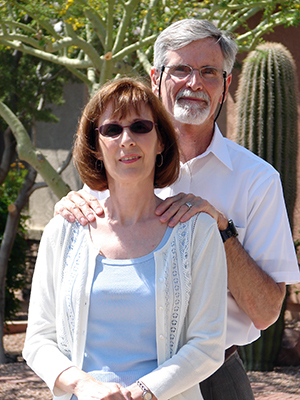 Pastor Wayne and his wife Sandy presently reside in Buckeye, Arizona.